· The price you pay the SMS aggregators for the SMS traffic transmission. Typically, SMS aggregators operate with MCC / MNC codes for destinations. Therefore, enable HLR lookup in PortaSwitch® to identify which mobile network a message recipient belongs to and to which SMS aggregator the message must be routed. Please refer to the PortaBilling® Administrator Guide for a detailed description of SMS routing with real-time HLR lookup. This chapter provides instructions for such a configuration. Customer SmartNet sends bulk SMS traffic to your network from their gateway via the SMPP protocol. You authorize SmartNet using the IP address and re-send their SMS traffic to the SMS aggregator (e.g. http://www.lleida.net) for further delivery to subscribers. SmartNet, as the SMSC (Short Message Service Center), requires that PortaSwitch® establish a binding connection with their gateway. Thus, SmartNet is configured both as a vendor (for PortaSwitch® to bind to their system as a transceiver) and as a customer, since SmartNet is charged for sending SMS traffic. 1. Set up an account with www.hlr-lookups.com. You will be provided with the credentials for API communication. 2. On the Configuration server clone the currently active configuration to modify it. · Username – Type in your account ID. · Password – Specify the password. 4. Select the SIP cluster and set Yes in the use_hlr_lookup option in the ProcessingNodeIMGate group. The majority of SMS aggregators operate with destinations that are defined in the E.212 format. This format defines destinations as a combination of the mobile country code (MCC) and the mobile network code (MNC). Therefore, to easily operate with SMS aggregators, enter destinations in PortaBilling® in the E.212 format. 1. On the navigation menu, type Destinations in the Search field. 3. In the Upload destinations dialog box, select Default destinations and click the arrow next to the E.212 destinations format. 4. Save a set of destinations as a .csv (comma-separated values) file. 5. Open this file in Microsoft Excel or any other suitable program. Edit the data if necessary and save your changes. 6. Switch back to the PortaBilling® admin interface and on the Destination panel, click Upload again. 7. In the Upload destinations dialog box, select Default destinations. 8. Select the check box for I have checked the default destinations. 9. Select the E.212 destinations format check box and click Upload. 2. Open the Create a destination panel. 3. Select E.212 in the Format field. 4. Fill in the destination information. This includes the MCC and MNC codes. Start typing the code to narrow the search. The Country and Network fields will be auto-populated. You can use the Description field to store extra information about the destination (e.g. proper). 6. Repeat these steps for any additional destinations you would like to add. At this point, it is necessary to create a domain service policy. This policy is used for internal communication between PortaSIP® and the billing engine. 1. On the navigation menu, type Service policies in the Search field. 2. Open the Create service policy panel. · Name – Specify the name of the service policy (e.g. SMS service). · Recipient domain pattern – Specify a pattern according to which the service policy will be selected. Type % for the SMS service. · Match priority – Specify 5 in this field. · Description – Provide a short text description of the service policy. 6. Open the Attributes panel. 7. 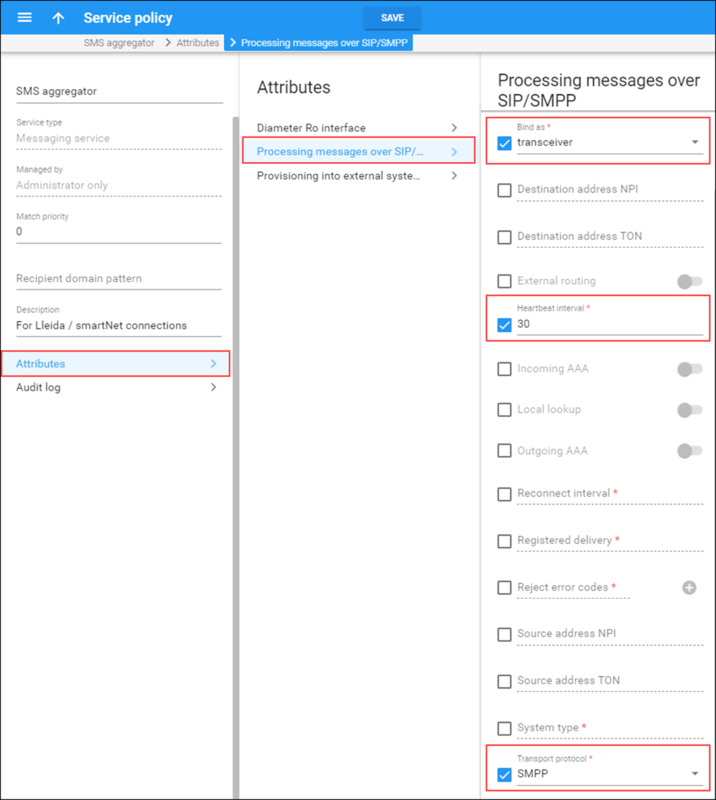 Select the Processing messages over SIP/SMPP panel. · Transport protocol – Select the check box and choose the SMPP option from the list. · Outgoing AAA – Select the check box. Use the slider to enable outgoing message authorization and billing. · External routing – Select the check box. Use the slider to enable sending SMS traffic to off-net vendors. · Local lookup – Select the check box. Leave the slider as it is (disabled). · Userpart Е164 translation – Select the check box. Use the slider to enable using the dialing rules for phone number translation. · Name – Specify the name of the service policy (e.g. SMS aggregator). · Bind as – Select the transceiver option from the list for the option to send and receive messages. · Heartbeat interval – Specify the interval (in seconds) in which ENQUIRE_LINK requests are sent to verify a connection. The zero default means no requests will be sent. Specify 30 for the SMS aggregator. NOTE: In case your customer’s parameters differ, in this case, SmartNet (e.g. Heartbeat interval is 10 seconds), create a new service policy specifically for this customer. 1. On the navigation menu, type Tariffs in the Search field. · Name – A short name for the tariff object; this is the name you will see in the select menus (e.g. Lleida Networks). · Currency – Indicates the currency in which the SMS aggregator charges you. · Format – Select the format the SMS aggregator operates with. Select E.212 from the list. · Applied to – Choose Vendor in the Applied to select menu. 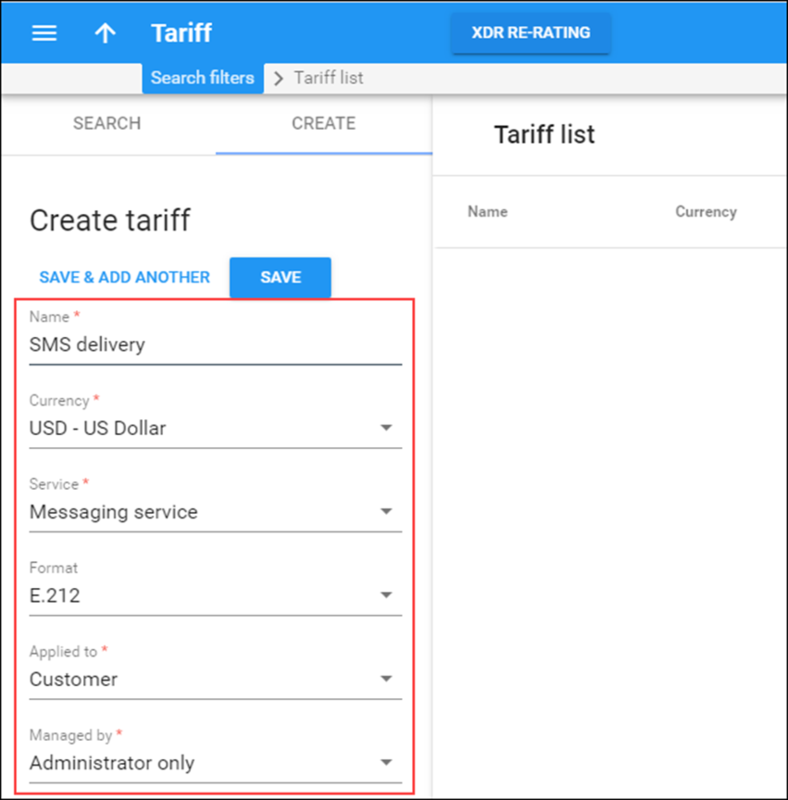 · Routing – Use the slider to enable this option since this tariff will be used both to calculate your costs and to route SMS messages. · MCC/Country – destination mobile country code. · MNC/Network – destination mobile network code. · Unit Price – price per message (e.g. $0.01). TIP: You can define route categories in the .csv file and upload the rates with the route categories assigned to them. Please consult the Rate Import handbook for more details. Perform the Create tariff and Upload sending rates steps described above until you have created a tariff with termination costs for each transmission partner you have. SmartNet is your customer and is charged for sending SMS traffic according to the customer tariff (which will be created later). Since SmartNet requires that PortaSwitch® bind to their system, SmartNet will be created as a vendor, too. Thus, a vendor tariff is required for a SmartNet connection. You do not need rates for this tariff, since it will not be used for SMS message routing. · Name – A short name for the tariff object; this is the name you will see in the select menus (e.g. SmartNet). · Currency – Indicates the currency. · Routing – Make sure this option is disabled, since this tariff will not be used for SMS message routing. Prior to configuring PortaBilling® you must first sign up for Lleida Networks’ SMS services. To do this, send an email to support@lleida.net to apply for an account. Upon successful account registration, you will be provided with an account login and password. These credentials are used to access the Lleida Networks user interface and also for PortaBilling® vendor authorization. 1. On the navigation menu, type Vendors in the Search field. · Name – Type a short name for the vendor object; this will be used on the web interface (e.g. Lleida Networks). When a message is sent from your network to the vendor’s gateway, the vendor performs an authorization for the message and provides you with a username and password to use for message authorization. These credentials must be stored with the “vendor authorization” info and then associated with a specific connection so that they can be used during actual message transmission. 5. On your vendor’s panel (Lleida Networks), click General configuration, then click Authorization. 6. On the Authorization panel, click Add and enter the credentials provided by the vendor. The connection is the point where SMS messages leave or enter your network and is therefore where costs are incurred. Please bear in mind that only one connection per Lleida account is possible for Lleida Networks. 1. On your vendor’s panel (Lleida Networks), click Connections. · Description – Give a short description to the connection that will be shown on the list of connections. · Service type – Select Messaging Service here. · Gateway ID – Specify the IP address or ID of the vendor’s gateway. · Service policy – Select the service policy you created for this connection (e.g. SMS aggregator). 4. Click General configuration panel. · Vendor authorization – Select the vendor authorization you created for this connection (e.g. Lleida SMS). · Name – Type a short name for the vendor object; this will be used on the web interface (e.g. SmartNet). When establishing a binding connection with SmartNet, PortaSwitch® sends credentials that SmartNet provides for authorization. These credentials must be stored with the “vendor authorization” info and then be associated with a specific connection so that they can be used during an actual binding procedure. 5. On your vendor’s panel (SmartNet), click General configuration, then click Authorization. 1. 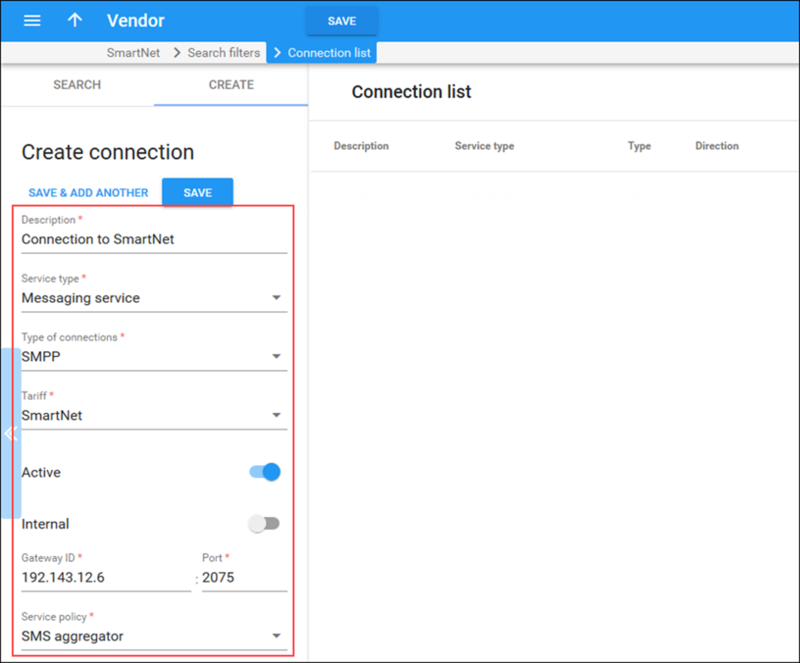 On your vendor’s panel (SmartNet), click Connections. · Description – Give a short description for the connection that will be shown on the list of connections. · Type of connections – SelectSMPP. · Gateway ID – Specify the IP address or ID of the vendor’s gateway (e.g. 192.143.12.6). 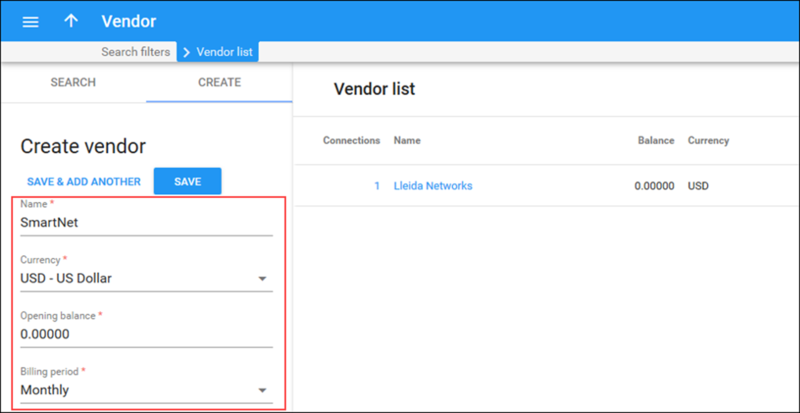 · Vendor authorization – Select the vendor authorization you created for this connection (e.g. SmartNet). This tariff will contain your customer’s rates for sending SMSs. · Name – Type a short name for the tariff object; this is the name you will see in the select menus (e.g. SMS delivery). 3. Service – Choose Messaging service here. 4. Format – Select E.212 from the list. 5. Applied to – Select Customer, as this tariff will be used to charge your customers. 6. Managed by – Select Administrator only here, since we are setting up a service without the involvement of resellers. · MCC/Country – Select the MCC / Country pair from the list (e.g. 230 for the Czech Republic). · MNC/Network – Select the MNC / network pair from the list (e.g. 01 for T-Mobile). NOTE: You must create an entry for MCC / MNC codes in the Destination register before creating a rate for them in the tariff. 1. On the navigation menu, type Products in the Search field. · Name – Type in a short name for the product object; this is the name you will then see in the select menus (e.g. Wholesale SMS). · Name visible to end users – Specify the name of the product that your customers will see on their self-care interface (e.g. Easy SMS). · Currency – Product currency; only tariffs that share the same currency will be permitted in the rating list. · Account default ACL – Choose an Access Control List (ACL) for accounts with this product assigned. ACLs control which objects end users can have access to and which actions they can perform. 4. On the Product panel, click Services and then Add a service. 5. Select the Messaging service and click Add. The Charges section provides access to a group of panels where you can set up overdraft protection and define how to charge your customer for a messaging service. On the Product panel, click Charges. On the General info panel you can define special pricing such as volume discounts, regular payments such as subscriptions, and set up overdraft protection. · Overdraft protection – Leave this box checked to prevent overdraft for users who use this product. · Breakage – Specify the minimum amount of funds the account must contain to use the services. · Default discount plan – This allows you to assign a discount plan for the product. Leave None as no volume discount plan is specified for this service. · Subscription – This allows you to choose a subscription plan for the product, so that this plan will be automatically applied to every account with this product assigned. Skip this step if no subscription plan is specified for this service. The Usage charges panel has two functions: it defines the permitted access points (nodes and access numbers) and specifies which tariff must be used for billing at each of these points. 7. On the Product panel, click Charges, then click Usage charges. 8. On the Usage charges panel, click Add. · Service – Select Messaging Service from the list. · Node – Select the PortaSIP node. 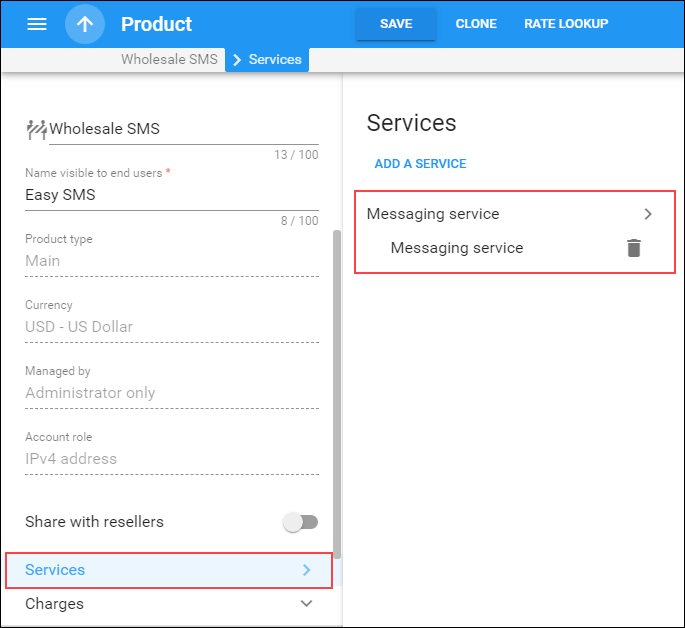 · Tariff – Select the tariff that will be applied to your customers for sending SMSs (e.g. SMS delivery). · Overdraft protection – Use the slider to send alerts when overdraft is detected. At the end of the billing period, PortaBilling® can produce invoices for your customers. An invoice reflects all the transactions (calls, payments, refunds, subscription charges, etc.) that occurred during a specific period. It serves as the primary record of services provided to a certain customer as well as the primary record of their status. To enable invoice generation you need to create a template for the invoice layout first. Create an invoice template as described in the Setting up a Wholesale Traffic Exchange handbook. Customer class provides the ability to globally define a group of parameters in a centralized way, and then apply those parameters to many customers at once. 1. On the navigation menu, type Customer classes in the Search field. Generate statistics – Leave this option enabled to generate statistics for customers. 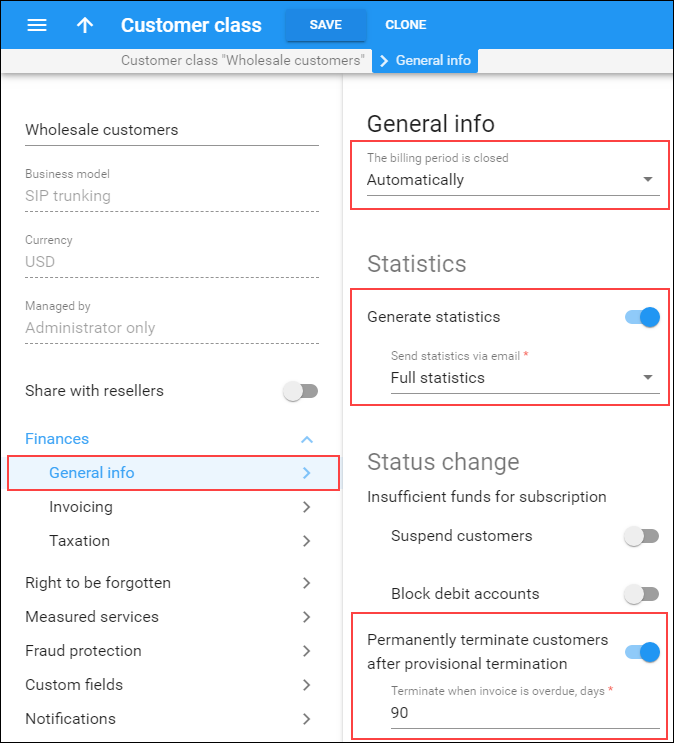 o Suspend on insufficient funds for subscriptions – Here you can specify whether PortaBilling® must check whether the customer has sufficient funds for their subscription charges. o Permanently terminate customers after provisional termination – Use the slider to enable the option. Specify the amount of days (e.g. 120) after which the provisionally terminated customer becomes permanently terminated. o Description – Your comments about the intended use of this customer class. 7. On your customer class panel, click Finances, click Invoicing, then click Regular invoices. · Invoice template – Select the appropriate template which will be used to create a .pdf file with the invoice for your customers (e.g. Wholesale invoice template). · Generate invoice pdf – Leave the default option At the end of the billing period to generate the .pdf files once the billing period ends. · Send the invoice via email – Select Automatically to automatically send an invoice to a customer at the end of the billing period. 10. 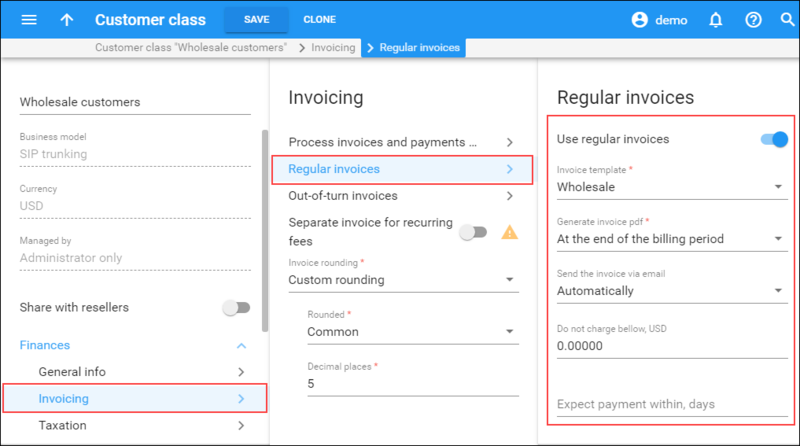 On the Invoicing panel, click Out-of-turn invoices (optional) to enable generation of the out-of-turn invoices (to cover only a few specific items) on demand for customers that belong to this customer class. Specify the invoice template and copy the settings from Regular invoices panel. 11. On the Taxation panel, specify the taxation method to be applied to your customers. A customer is a company that sends SMS traffic for you to transmit and pays depending upon the amount of traffic sent. The customer’s contact information is used to distribute account usage information, service usage statistics, invoices, etc. In this example, we will describe how to manually create a new customer, without using a Quick Form. · Business model – Select SIP trunking for this customer. A business model defines what type of service is to be provided to the customer. 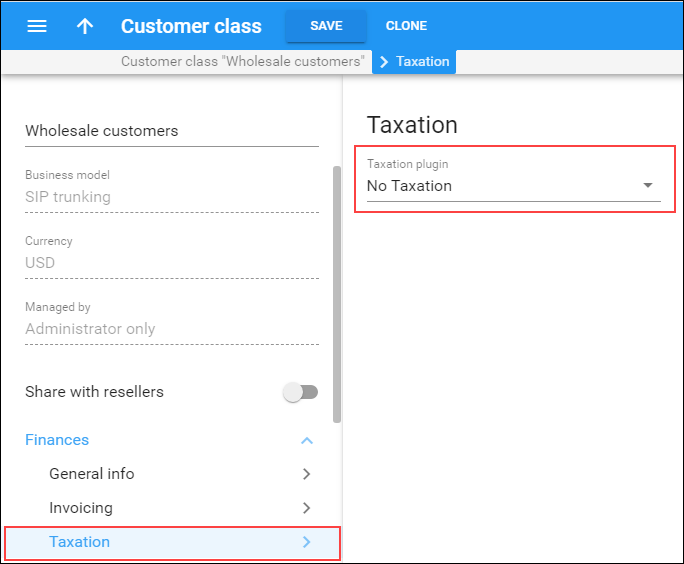 · Customer class – Select the previously created customer class for wholesale customers. By choosing a specific class here the customer will automatically inherit all of the class properties (grace period, invoice template, etc.). 1. While on the Personal panel, click Address info. 2. On the Subscriptions panel, set the Suspend on insufficient funds parameter. This defines whether the system must check that the customer has sufficient funds for their subscription charges. NOTE: To specify several credit limit warning thresholds, enter the values by clicking . This is a convenient way for managing parameters which are the same for a whole set of accounts. Instead of trying to configure them for each individual account, you can define them once at the customer level, then specify in the account configuration that the value in the customer’s configuration be used. If you wish to change this value later, you need only modify it once for the change to be automatically propagated to all accounts. For now you may leave these with their default values. If you change them later, these changes will automatically affect all accounts created under this customer. Accounts enable the authorization of a customer’s actual end-points. In our example, we assume that the authorization is performed by the IP address of the remote gateway / proxy. · ID – The IP address for the customer’s proxy or gateway (must be identical to the IP that is mentioned in the connection). · Product – Choose the main product that you would like your account to have. · Activation date – Choose the date from which the account is usable. By default, the account is activated immediately upon creation. · Balance control – Choose Subordinate, since a credit limit is controlled at the customer level. You may check the routing for an SMS in your system prior to actually sending a message. The system will perform the HLR lookup and you will see the routing results based on the MCC / MNC codes for the destination number. 1. In the Routing section of the Admin-Index page, choose Test Dialplan. 2. Enter the destination phone number and service type. 3. Select the HLR Lookup check box to enable HLR lookup. You can configure the SMPP client / gateway to send messages to your PortaSIP® server. To do this, use the PortaSIP’s virtual IP address and port for incoming SMPP connections (which is 2775 by default). Since authorization is performed by the SMPP client / gateway IP address, you can set any values for the SMPP login and password. Then send a message.